Ulises A. Mejias offers us a network critique in the final talk of the parallel session ‘Network and Subjectivities.’ In his talk about ‘Hyperlocality and the tyranny of nodes’ he argues that we can see a shift in the way we see networks. First networks were used as metaphors but now networks are used as models to organize sociality. What does nearness feel like when mediated by the network? How is subjectivity shaped by the network? To what extent are we able to influence the architectures of social participation of the network? What are the blind spots in the network and what do these blind spots signify? Manuel Castells has argued that the distance in a network between nodes in a network is zero. Mejias notes that there is an important change in the way we define nearness: we talk about nearness in terms of social relevancy and not in terms of physical proximity. Just because there is no distance, does that automatically mean it is near? The network thrives on connecting nodes and in making connections it does not care where the nodes are located. The network emerges within a political and economical framework and we must question what the implications are. 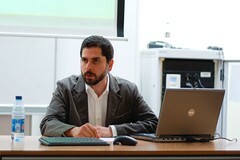 Mejias proposes a critical theory of the social affordances of networks through the concepts of nodocentrism and paranodality. If we take into account Castells’ argument the distance between nodes is zero and that the distance between a node and something outside the network is infinite than only nodes are accounted for. 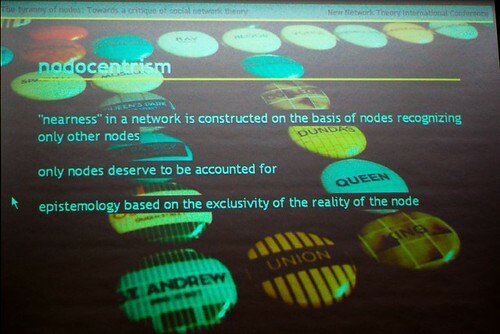 Thus, nodocentrism is the belief that only nodes deserve to be mapped, explained or accounted for. We can see this in the mapping and visualizing of networks where nodes and their connections are mapped and visualized. We can also see it in ubiquiotous computing and implementing objects with RFID to bring them into the network where they can be tracked and traced. Nodocentrism is the tyranny of the nodes but what is nodocentrism afraid of then? It is afraid of the paranodal. The paranodal is the space between nodes that is not mapped but just because it is not mapped does not mean it is not there. It is a site where we can say no to the network while still being related to it. The space is not a dead space but a space that is very much alive and dynamic because the changes in the space over time give the nodes their identity and their history. Information that is being transfered between nodes will go through the paranodal and can be distorted. So whether the network acknowledges the existence of the paranodal or not, it must adjust to its presence. It is a way of resisting the nodocentric view of the world. The paranodal is the space between the nodes, a site of disassociation, a site of possible resistance. I would say that Mejias argues that New Network Theory must take into account both the nodes and the paranodes of the network. It reminded me of Alexander Galloway who argues that there is no resistance possible to protocol, that resistance is only possible within protocol. Could we say that there is no resistance possible to the network and that resistance is only possible within the network? 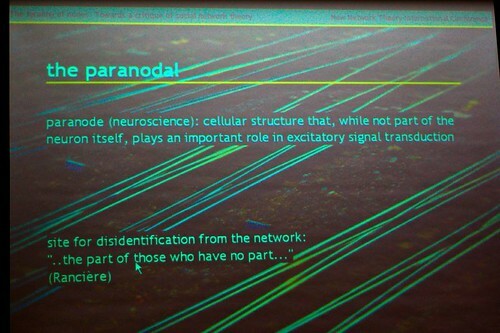 That without nodes there are no paranodes and without paranodes there is no network? 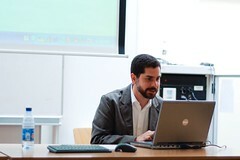 The slides, transcriptions and MP3 of this excellent presentation can be found at Ulises A. Mejias’ blog.